“BB Forever: Brigitte Bardot, The Legend” and the accompanying interview with Brigitte herself in next months Vanity Fair. Vanity Fair takes a look at some stunning photographs of “The Temptress of St. Tropez,” Brigitte Bardot that accompanies their interview with the 77-year old star for their March 2012 issue. Many of the photography in the gallery will tour the United States as part of the ”BB Forever: Brigitte Bardot, the Legend” exhibition appearing at Sofitel hotels in Los Angeles, Chicago, Washington, and New York. The rare visit to the star’s home by the show’s curator, Henry-Jean Servat, is a great read and is available online. Bardot who lives in St. Tropez removed herself from the spotlight and public in the early 70s. Well worth a read. 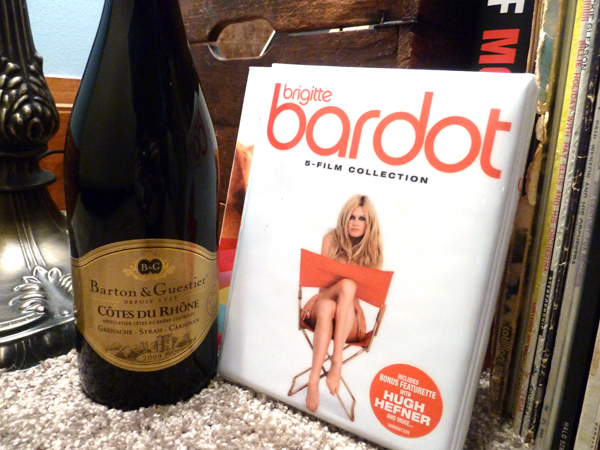 The article kind of got me in the mood for more BB, so tonight I think a little pre-birthday celebration is in order with a selection from the Brigitte Bardot Box Set and a lovely bottle of Barton & Guestier Côtes du Rhône. How much more French can you get? Mon Dieu!